As I contemplate another round of frantically attempting to eat everything in my fridge before it begins to resemble a series of particularly hideous lab experiments, it occurs to me that now might be a good time to make some fried rice for dinner. Possibly the most useful vehicle for leftovers known to frugal and/or desperate cooks, fried rice is infinitely versatile. You can use raw or cooked ingredients, or a combination of both. You can make it vegetarian, or a carnivore’s delight. You can take it in any Asian direction you fancy, or you could even get really crazy and make, say, Italian fried rice (olive oil, pesto, cheese?). Pretty much the only ingredient you must have on hand is a couple of cups of cold, cooked rice. The rest of it is open to taste, interpretation, and what’s closest to going off in your fridge. 1. Heat up some oil in a pan that will allow you to stir everything vigorously without throwing it all over the stove. A wok is optimal if you have one; I don’t, so I use a large Le Creuset casserole pan. Turn the heat up as high as you dare. 2. When the oil is hot, add some sliced member of the onion family (regular onions, scallions/spring onions/shallots, etc.). 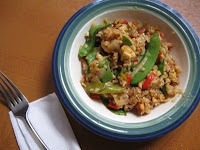 If you’re going for Thai flavorings for your fried rice, add a couple of teaspoons of brown sugar now, too. If you’re going for hot and spicy, also add some chopped fresh chili, ginger, etc. at this point. Cook, stirring continuously, until the onions start to soften. 3. Add whatever raw ingredients you’re using, starting with the one that will take longest to cook (carrots, for example). Continue stirring. 4. When these ingredients are well on their way to being cooked, dump in the cold, cooked rice. Stir to combine everything. 5. Add your sauce of choice. (Again, for a Thai-flavored dish, I use two parts each soy sauce and lime juice to one part fish sauce.) More stirring. 6. Add any cooked ingredients to warm through for a couple of minutes, still stirring. 7. Taste to adjust seasonings, add any garnishes, and serve immediately. Oh no on the fridge!! I think that a new one is going to be in order, my friend. This has been going on too long. But hey -- fried rice is good! Well, today is Return of Fridge Guy, so we'll see what he has to say. Meanwhile, the perishables-eating frenzy continues!